A picture is worth a thousand words. In this case, the picture has a couple words, but conveys a whole concept. Capitalism and materialism is seeping further and further inside us, and it's hard to stop it. Blame whatever you want. The Digital age. Corrupt governments. Invasive and unethical media. Whatever. It is what it is. It can be hard to remember that experience > things. Sometimes the experience only involves going to the park. Walking around your neighborhood. Sitting in the grass. Talking to a friend. PSA to myself and everyone out there who gets caught up in the mess of it all sometimes. We're freer than we think. 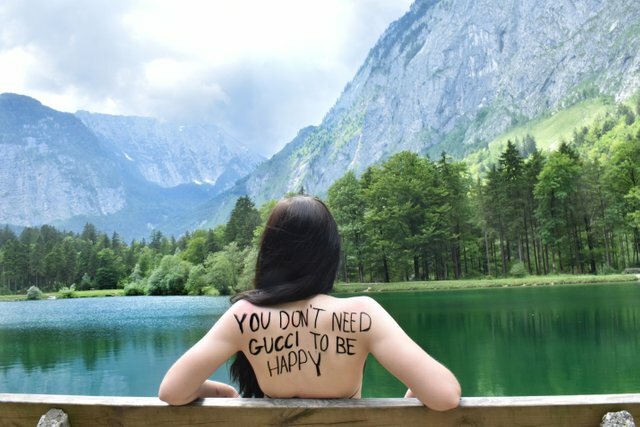 I will say that we're as free as we think we are, and yeah, that "Gucci things" you mention about can tie us to expensive nonsense more than one can imagine.